Canadian Overhead Railway 1918. | The Military history of Slindon. This is a photo thought to be taken at Slindon 1918. 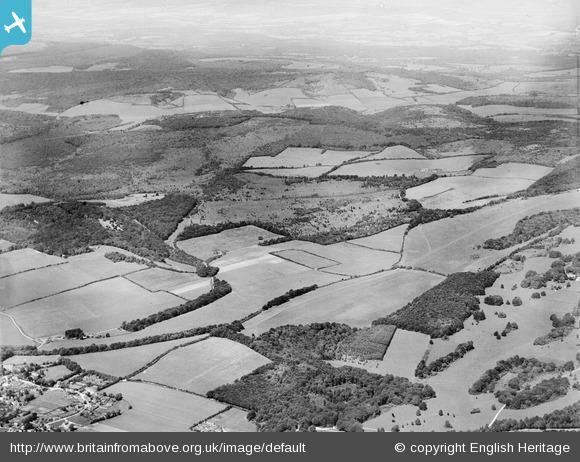 This photo taken in 1935 shows the woods at Slindon And Eartham. 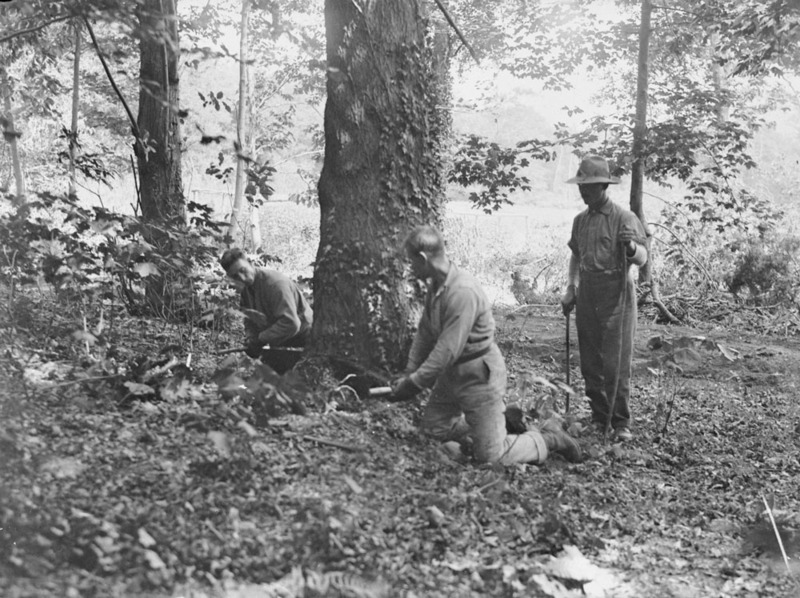 Men shown cutting down a tree , hard work, no chain saws. One of the most important person in a camp, keeps saws sharp. Bandsman. 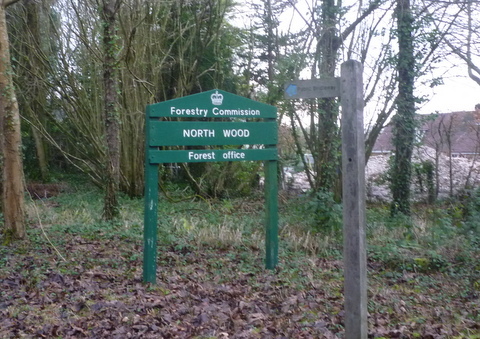 Footpath from Eartham road to North wood. 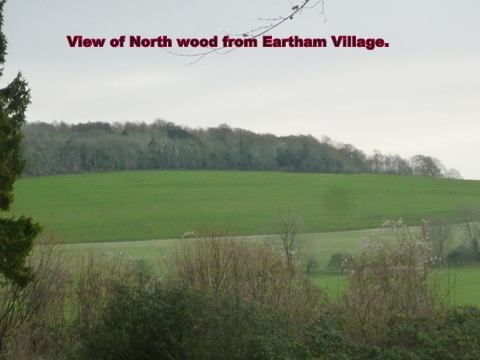 This is taken from Eartham village road, the woods are of North Wood,. This is the only photo of the rope-way taken maybe Slindon circa 1918. The photo is of poor quality being taken from a glass plate. Copyright Canadian National Archives: To be used for educational uses. 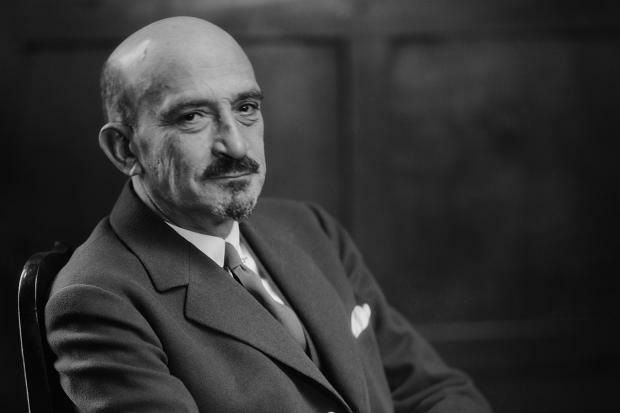 Manchester- based chemist Chaim Weizmann with producing large quantities of acetone from readily available raw materials. 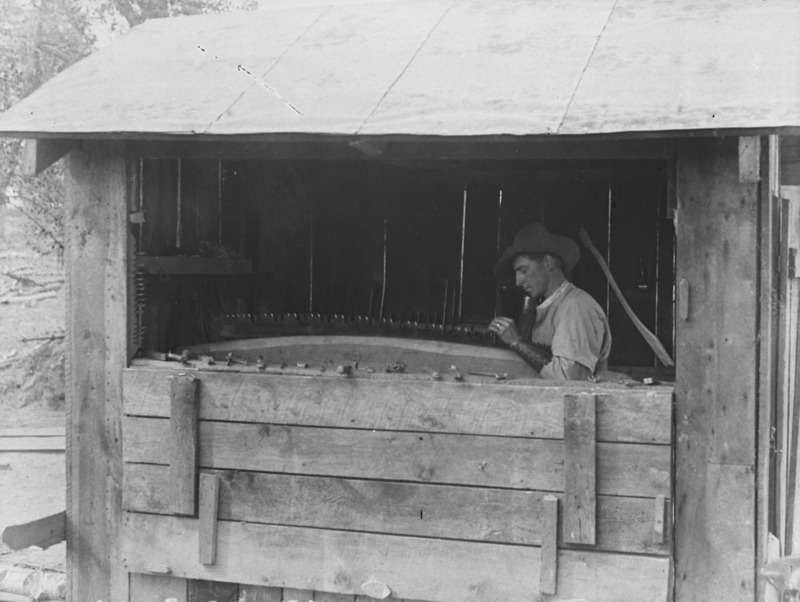 It had previously been made chiefly from dry distillation of wood; hence, most of Britain’s acetone was imported from timber-growing countries like the United States. In May 1915, after Weizmann had demonstrated to the Admiralty that he could use an anaerobic fermentation process to convert 100 tons of grain to 12 tons of acetone, the government commandeered brewing and distillery equipment, and built factors to utilise the new process at Holton Heath in Dorset together, they produced more than 90.000 gallons of acetone a year, enough to feed the wars seemingly insatiable demand for cordite. As a result, shell production rose from 500.00 in the first five months of the war to 16.4 million in 1915. Conkers & Chestnuts were collected by school kids during WW1 for conversion to acetone; they were paid a penny or two for their efforts. The ropeway was built using German Prisoners of War, something that strictly speaking was not allowed by the Geneva Convention, as this was aiding the War effort. The construction of the ropeway was completed in less than 3 months there is little to see now on the ground, except for the odd concrete post along the route. From West Sussex Records office. Goodwood Ms. 1315 and 1316. Goodwood Ms. 1315 is described as letters relating to the ropeway between Eartham Woods and Lavant (7 docs), and consist of letters from the Board of Trade (Timber Supply Department) to the Duke’s agent concerning the proposed ropeway between North Wood in Eartham and Lavant, mainly dated 1918. There is a letter from the British Ropeway Engineering Company, April 1918 and a letter dated August 1918 stating that they have straightened the route of the ropeway between Eartham Woods and Lavant to avoid the necessity of a junction. Goodwood MS. 1316 is described as letters relating to the Mid Lavant Wood Distillation Factory, 1918-1924 (12 docs). These include letters from the Treasury Solicitor on behalf of the War Office and concern the lease on the property formerly held by Mr. Mortimer on field no. 88, part of West Lavant Farm..
Further, Lavant History Group 2000. ‘Towards the end of the First World War there was a discussion about building an ammunition factory in the village, the site being at the bottom of the present day Eastmead Industrial Estate into Lavant Down. It was built below ground with a brick building above together with a large chimney. A Canadian aerial railway was constructed to bring trees from Eartham Woods via Chalkpit Lane and then over to the factory. A weighing machine to which the trees came stood where the Elf Garage is now situated. Bill Squires recalls how he and some lads used to catch a ride on the tree trunks as they came over the brow of the hill! 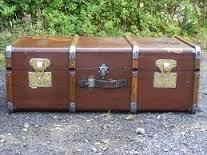 The trees were cut to make props which were then sent over to France for use in the trenches. There is no recollection of shells or other items of ammunition being made there. At the end of the First World War the aerial railway was closed and the factory closed down’. Elizabeth Woodford (ed. ), Lavant a Century Ago (Lavant History Group, 2000). Further research has unearthed further information. asked the President of the Board of Trade for what purpose it is intended to use the overhead rope railway at Goodwood, in view of the fact that it has now broken down, and that several of the metal trollies are lying rusting on the ground; if he will inform the House how long this railway was actually in use; and what amount of timber, if any, was actually transported by it? In reply to the first part of the question I would refer my hon. and gallant Friend to the answer given him on 18th August last. As regards the remainder of the question the ropeway has been in use for over a fortnight and has transported about three hundred tons of timber. I may add that this ropeway was specially inspected on Monday last and found to be working satisfactorily. No breakdowns have been reported. asked the President of the Board of Trade if he will state the purpose for which it is intended to use the overhead railway now being constructed by the Government over a distance of about seven miles across the Duke of Richmond’s Goodwood estate, in view of the fact that the object for which this railway was originally intended, i.e., to carry timber to a Government factory at Lavant, no longer exists, the factory having been closed since 18th July and advertised for sale? The ropeway referred to was intended not only to supply the factory but to carry plank timber to a point where it can be put on the railway. The ropeway, which is on the point of completion, will still be required for the latter purpose. Is it intended to continue work on this ropeway? Yes. The ropeway is now on the point of completion. As there is a perfectly good main road adjoining North Wood, to which the timber is being brought, why cannot it be hauled along the road, and why is it necessary to construct, at great cost, an overhead railway in the wilds of the country? I have not myself had an opportunity of seeing the locality, so I cannot express any opinion as to the excellence or otherwise of the high road, but this ropeway was, I understand, started to work in connection with a factory. The factory construction was stopped, but the ropeway construction was so far forward that it was cheaper to complete it. In view of the fact that this is regarded in the locality as a very grave scandal, will the right hon. Gentleman look into the matter and make some further reference to it when the House meets in the autumn? A very easy method of raising the matter will be to put down a question. Is this one of those Departmental snowballs which cannot stop rolling? Hansard 1810- 18th August 1919. 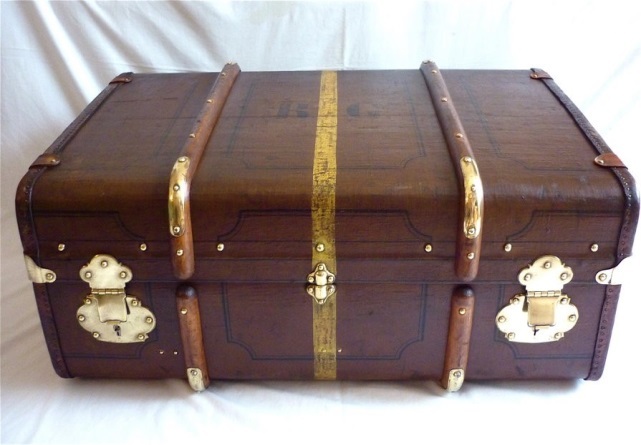 Wood from the estate was at this time being transported to Goodwood by the rope-way to a factory making bent hoops to encircle cabin trunks, the only factory at this time in the UK. 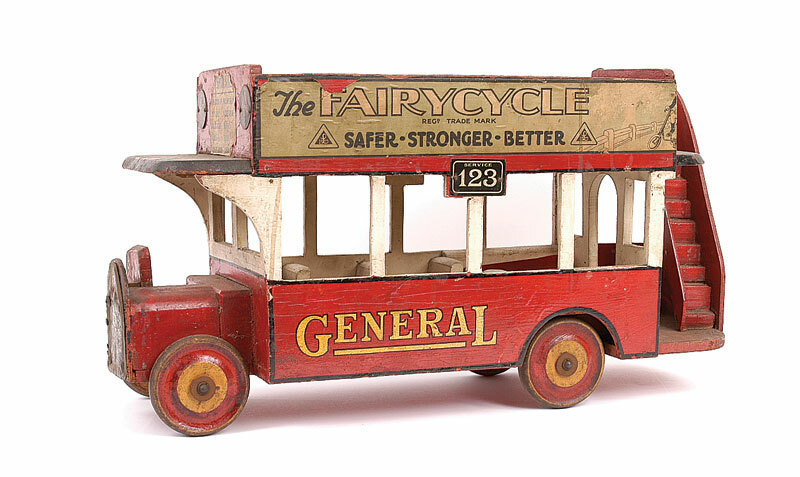 The later years of use was restricted to the transportation of small wood to a factory set up post war by two brothers George and Joseph Lines , Lines Bros Ltd they were making wooden toys for boys and girls, later became Tri-ang . They later moved to Morden. The ropeway was finally removed late 1922, there are very few remains to be seen now except for the odd bit of concrete along the route of the rope-way.